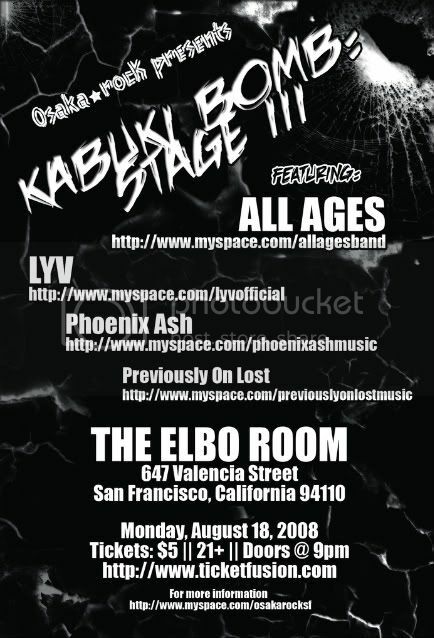 Come and check out the 3rd installment of Kabuki Bomb presented by Christian Hart, Osaka★rocK, and The Elbo Room ! All Ages and LYV come together again after performing at Fanime Musicfest for another hard rocking night! WooT gonna try and make this one! It'd be fun to rock out sans the black suit! Dude... I'm thinking party hard sushi, sake and rock night! either way if i do make it, this looks like a great venue and a great list of bands. I am definitely going to try to make this christian.